Aranya this Eid has made a breakthrough by developing a special technique to combine block print with wax print. They have also introduced the Shibori tie-dye techniques of Japan, adapted to our taste. These, when translated to a customer's language mean a wider range of colour combinations and layouts and a definitive change in what you wear this festival season. "Of course these techniques, specially the first, are not difficult in chemical dyes, but to my knowledge it has never been done before anywhere in the world," says Ruby Ghuznavi, obviously content with the fact that hers is a store where exclusivity is the key word.So this Eid, scratch out the high street fashion look from your mind and go for a real classy look. The sarees are usually the top selling items during this season in Aranya. Kantha sarees will be available in batik and embroidery. The speciality of Aranya kantha sarees is that the whole body of the saree has work instead of only the border or the anchol. Considering this, the price range of kantha sarees is quite reasonable at Tk.5300-Tk.6000. 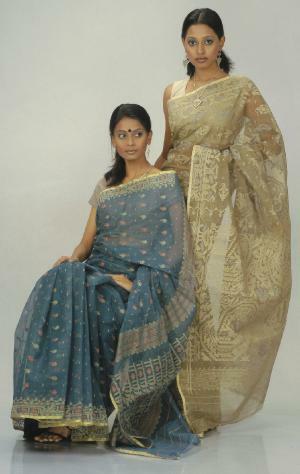 Crepe sarees in batik, tie-dye or embroidery are also quite intriguing and will be a part of the Eid collection. For Eid sarees unusual batik patterns have been introduced. Those with double or repeated batik prints look quite gorgeous. 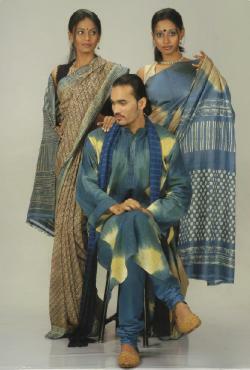 Also striking are crepe sarees, which are a blend of batik, tie-dye and embroidery. Crepe sarees start from Tk.4300. Silk sarees will also have good variety, as they are popular during Eid. Half silk, which is quite well-liked for daywear during Eid, will cost in the range Tk.1500-Tk.1700. 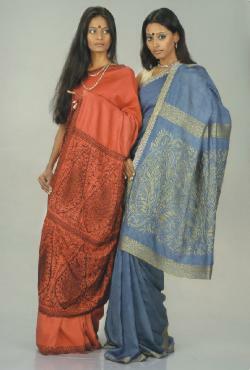 For Eid, blue and red dyes will dominate the colour scheme of sarees. The red dye, known as monjit is quite eye-catching. Tosshor sarees will be available in batik and tie-dye and prices start from Tk.4100. Silk sarees with chikan work also look elegant at a reasonable Tk.3500/-. Jamdani with vegetable dyes can be another good choice and is available in nice earthy tones such as light brown and olive. Men are not to be left out and Aranya shows promise to be the favourite place for punjabi buyers during this Eid. There will also be "kantha" work and print, which will cost around Tk. 1500. You will have to shell out Tk.1300 if you want to buy a vegetable dyed silk punjabi. The Eid line of shalwar kameez sets will have a combination of vegetable dyes, embroidery and bloc prints in silks, which will be around Tk.4700. Crepe salwar suits is another attraction with batik prints and I must say that they are unique. Have a look at silk salwar kameezes with kat-chupi work, which is intricate embroidery. Kantha dupattas, which can be bought separately and will lend a charm to your Eid shalwar suit. Check out the reversible cotton and silk shawls with embroidery, tie-dyes and print that look extremely fashionable. This shawl comes at Tk.3500 and can add versatility to your wardrobe. Scarves are something that Aranya excels at and the tradition is going to be continued this season. Kantha scarves go well with desi as well as western wear. Scarves with full kantha work, embroidery and block prints are priced at Tk. 1650. For those of you who love ethnicity in clothes, Aranya will have a lot to offer during the coming Eid.